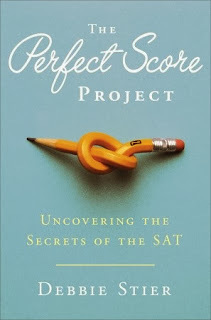 The Perfect Score Project by Debbie Stier is a fascinating book (borne out of a fascinating plan!) - 281 pages, 20 chapters of SAT prep information wrapped in the true story of a mom who took the SAT seven times while working to encourage her son to do his best rather then settling for mediocrity. Is that novel, or what?!? You don't have the opportunity to read about this type of undertaking every day; needless to say, I was very interested in Debbie's story. The Perfect Score Project is an informative, well-written book that makes the reader feel right at home as soon as you turn to page 1. Each chapter has "info boxes" that contain valuable tidbits to help your student get the most from their SAT preparation ~ so no worries that this book just tells Debbie Stier's tale of taking a difficult standardized test over and over again. Nope, the book doesn't just tell her tale, it gives loads of excellent information that moms of high-school students can use. As a mother who was asked to participate in a Q&A session/private interview with College Board representatives, and one who has perused the site fairly extensively, I feel somewhat qualified to say that this book is a good resource to have on hand if you have a child considering college. And why take a chance with a test score that could save tens of thousands of dollars in student loans? A good score = money for college. Resources that lead to a good score = a great investment. I do, however, have to share a disclaimer. I'm a homeschooling mother, and the official name of my blog is "Encouraging Moms Who Homeschool". That is why I write - to encourage homeschooling mothers. And I'm not quiet about my faith in Jesus Christ on my blog. So it won't come as any surprise when I say that this book, as it is written to an audience that is much broader than the audience my blog is written for, is not what I'd call "clean". There is language that I do not approve of ~ curse words and misuse of God's name. Not on every page, and maybe it's mild as compared to other non-Christian books. But I cannot post a review of this book to my specific audience and leave out those details. It bothered me when reading the book, and I assume it would also bother others. On my "Page Turner Scale" of 1 to 5, I gave this book a 5. To learn more about the book, visit PerfectScoreProject.com or read more @ Random House online. Can A Little Change Make A Big Difference?